Behavioral enrichment is a concept pretty widely known in zoo animal husbandry but not as commonly known / used in the equine industry. With any stalled or confined animal, providing mental stimulation during the day can help reduce anxiety and boredom. Cribbing, weaving and pacing are some examples of negative behaviors common to domestic horses. Providing your horses with enrichment can help to prevent or reduce these behaviors. We all want what is best for our animals, our horses included. 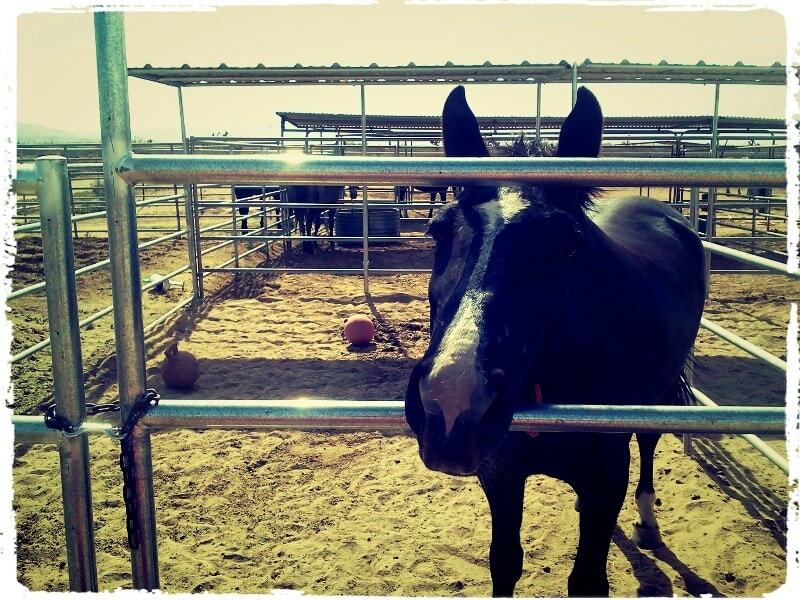 If you think about it, most domestic equines spend all day in confinement until we can come to take them out to “play”. These enrichment ideas can be used for any horse whether they board in a 12×12 box stall, live in a small paddock or roam a large pasture. Make sure your horse respects a stall guard before leaving him/her unattended with one. Most horses will be fine and appreciate being able to look out into the barn aisle but some may challenge or bolt through the opening. Stall guards with closed fronts are generally safer than cheaper ones with holes. More holes in the stall guard = more places for your horse to get tangled. Consider making sure the stall guard has a break away or securing one or both sides with zip ties just in case. Horses are meant to graze for a big part of their day. Something as simple and easy as providing a slow feed hay net for them to munch on throughout the day can help to keep them occupied for larger parts of the day. If you shop for a hay net locally be sure to look for “slow feed” hay nets. Slow feed hay nets have smaller holes which make it harder for the horse to get the hay. If your horse isn’t used to a hay net maybe start with a 2″ hole size like this one below and move up to a 1.5″ once he gets the hang of it. Safety Tip: Make sure hay nets are hung high enough that, when empty, the horse is not likely to get a foot stuck in the net. We created a Pinterest board with stall toy ideas. Fill a gallon milk jug about 1/4 to half-way full with rocks and hang from the stall. Add treats or hay pellets to a gallon milk jug and cut a small hole about half way up so as the horse tosses the milk jug around, pellets can pop out. During the summer, freeze treats into a block of ice and drop into their grain bin or water bucket. As the ice melts they will be able to start eating the treats. This may have the added benefit of encouraging them to drink! Have any construction cones lying around? Horses tend to find those fun to play with as well! Find basket balls or other “human” sports balls at a local yard sale or thift store? Those make great stall toys as well! Horse’s can get “bored” with their toys too so it is best to mix it up. Maybe this week it’s a Jolly Ball, Next week it’s a treat roller, and the following it is a traffic cone. To keep things interesting for your horse, keep it new by rotating toys. A Jolly Ball that a horse hasn’t seen for three weeks is probably more interesting than one he has lived with for the past three months. Anytime you DIY an enrichment idea, keep in mind the materials you use and the propensity your horse has for getting himself hurt. Plastics can degrade in the sun so if you use a milk jug, you will want to replace it every month or so or it will become brittle and crack. When hanging items, experiment with height to keep things interesting but you want to make sure that if your horse pulls hard, the roof isn’t going to come down! Swivel clips and zip ties will help ensure items that are hung can rotate and will break away if needed. Keep in mind that anything with handles (even Horse Buckets) can get caught around a hoof. While most hay nets have holes too small for hooves, the end of a shoe can get caught in them. Have You DIY’d any stall toys or horse enrichment items? We’d love to see them!